Zion Market Research has published a new report titled “Load Cells Market by Type (S-Type, Single-Point, and Shear-Beam), by End-Use Industries (Automotive & Transportation, Oil & Gas, Healthcare, Industrial Manufacturing & Material Handling, Defence & Aerospace, and Construction), by Technology (Digital and Analog): Global Industry Perspective, Comprehensive Analysis, and Forecast, 2017 – 2024”. 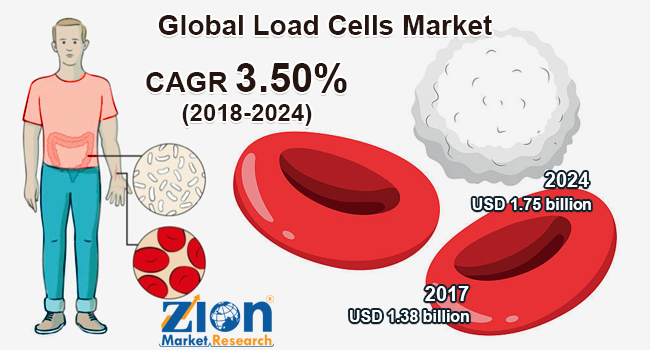 According to the report, the global load cells market was valued USD 1.38 billion in 2017 and is expected to reach around USD 1.75 billion by 2024, at a CAGR of approximately 3.50% for the forecast period from 2018 to 2024. The load cell is a device or a sensor that creates an electrical output. Although there are different types of load cells such as strain gauge, hydraulic load cells, and pneumatic, strain gauge load cells dominate the weighing industry. The pneumatic load cells are used in the sectors where the intrinsic hygiene and safety are required whereas; hydraulic load cells are preferred in remote locations. Designing of load cell could be differentiated according to the way of detecting weigh or according to different types of the output signal generated. The market for load cell is anticipated to expand at a CAGR of approximately 3.50% during the forecast period from 2018 to 2024 and market is expected to reach approximately USD 1.75 billion in terms of revenue by 2024. The global market for load cells is driven by rising investments in industrial automation technologies and its increasing use in automotive assembly lines, logistics, construction, and metal and mining industries. This market also forms an integral part of industrial weighing scales, weigh platforms, weighbridges, tensile testing machines, and dynamometers. Weighing of tanks, vehicles, vessels, silos, conveyors, quality control, R & D testing, fatigue testing, and crane performance monitoring of industrial environment are some of the typical applications of load cells. The load cells market is segmented into type, end-use, technology, and regions. The type segment for the load cells market includes s-type, single-point, shear beam and the end-use segment holds automotive and transportation, oil and gas, healthcare, industrial manufacturing and material handling, defense and aerospace, and construction. Further, on the basis of technology, the market for load cells is segmented into digital and analog. The market is categorized based on five regions namely North America, Europe, Asia Pacific, Latin America, and the Middle East and Africa. The regional segment is divided into various countries such as the U.S., UK, France, Germany, China, Japan, India, and Brazil. Some of the leading manufacturers identified in the global load cells market include Vishay Precision Group Inc., OMEGA Engineering Inc., FUTEK Advanced Sensor Technology Inc., Hottinger Baldwin Messtechnik GmbH, Flintec Group AB, Thames Side Sensors Ltd., Yamato Scale Co. Ltd., Zhonghang Electronic Measuring Instruments Co. Ltd., Mettler Toledo International Inc., Novatech Measurements Ltd., and Precia Molen, among others.